I can't claim credit for coming up with this. I saw it on Facebook or Pinterest or something like that. For pumpkin carving this year, kiddo and I shamelessly ripped off the idea of buying small ghost pumpkins (sometimes referred to as "Baby Boo" pumpkins) and using plastic vampire teeth for their mouths. The thing to remember about Baby Boo pumpkins is that, since they're small, they tend to rot faster than their larger counter parts. 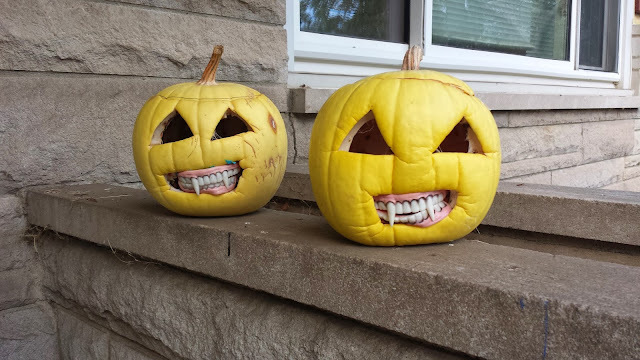 Personally, I think that a little bit of rotting makes them look even scarier.